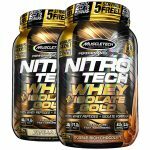 Muscle & Strength Sale + Free Protein Crisp – Box on order $59. There are so many great combos in the promo – so check them out. Even better for a limited time, all orders over $59 receive an additional box of BSN Protein Crisps and over $89 receive Free T Shirt. Available in 6 flavors for this price. Add the protein to your cart, the bars will be automatically added.